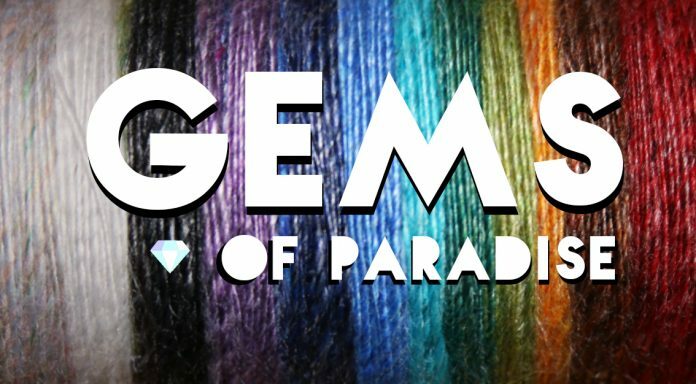 Find your fade in our new Gem inspired line of micro-blends. 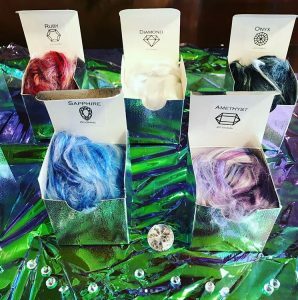 These combed tops consist of Rose fiber, Superfine Merino Wool, Faux Cashmere, and Mulberry Silk! 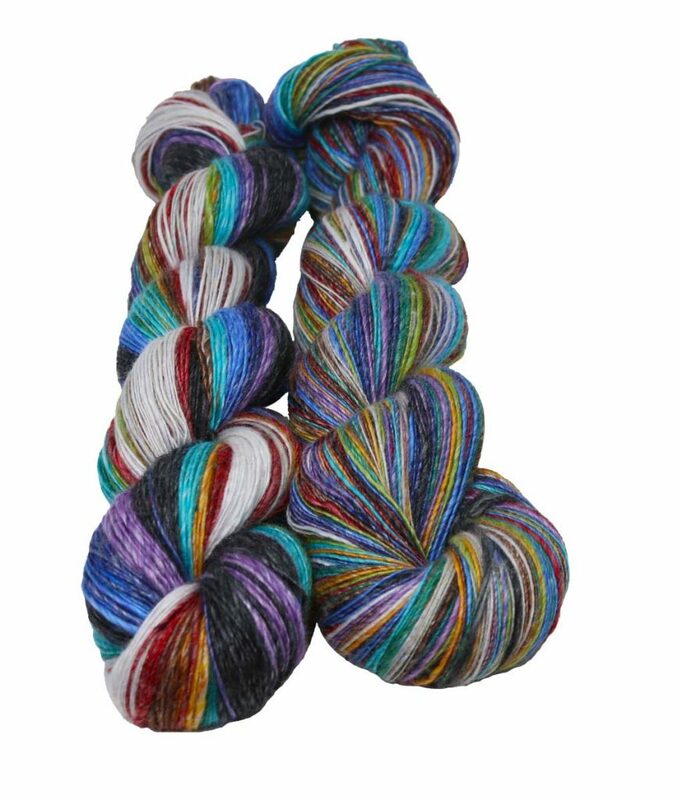 This fiber lends itself to beautiful yarn with incredible drape and luster. These blends are super soft and feel like butter in your hands. Which colors are your favorite? Get them here. A fractal is when a similar pattern recurs at progressively smaller scales which has the same character as the whole. You can find these fractal patterns in crystal growth, galaxy formation, snowflakes, and so much more. 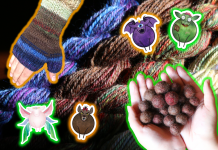 Here are the steps to create your own fractal yarn. 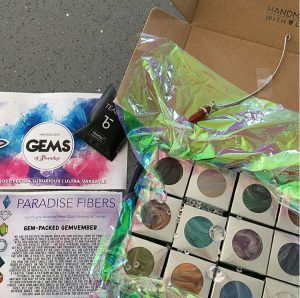 Step 1: Determine your fiber – In this case we are using 12 colors ( 20 grams each ) found in our Gems of Paradise Line. You can use as little as two colors or as many as 100 or more. 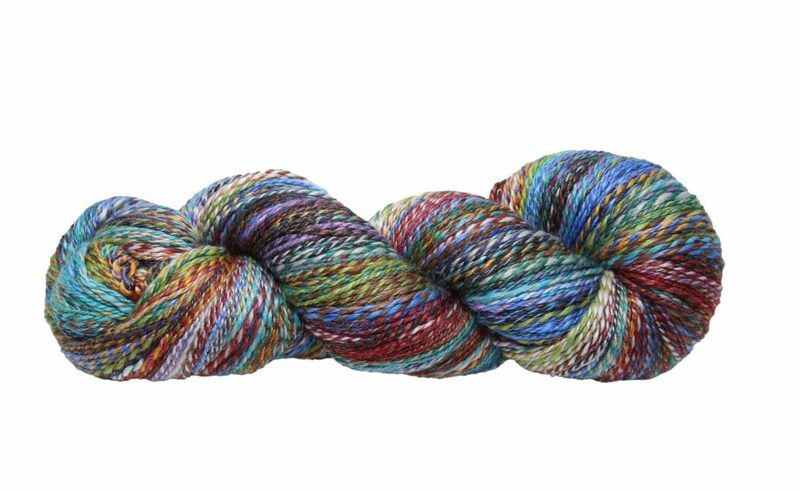 Our Fractal yarn is going to end up being a 2-ply yarn; to start we are going to spin a full bobbin of all 12 colors, spinning the colors, worsted style, from end to end to create a yarn with long color blocks. 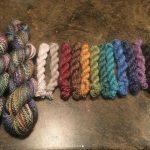 You can read all about worsted style spinning in our previous blog post here. 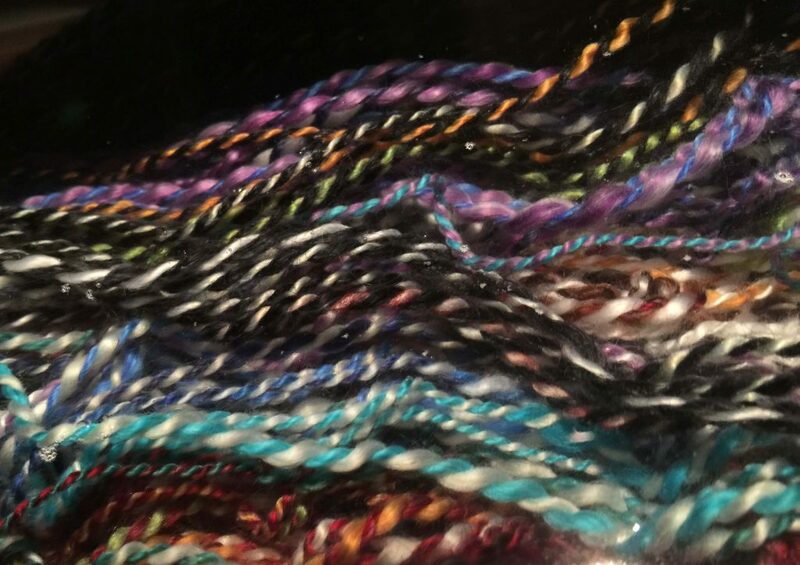 My bobbin allowed for each color to fill the bobbin with one even pass, spinning 10 grams of each color approximately. I introduced a good amount of twist to the yarn since I will be plying in the opposite direction later, I didn’t want to lose any twist. 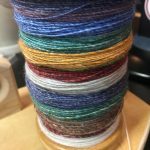 Step 3: Split your second grouping of fiber – Once you’ve spun a full bobbin of one grouping of fiber set your bobbin aside and you’re ready to spin your second single. Split your second grouping of fiber lengthwise into 8 -10 smaller equal portions. 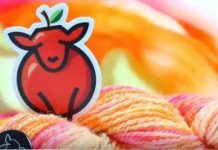 You will spin each grouping in the same color order as your first single spun, spinning end to end to create short color blocks. 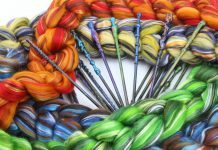 Introduce the same amount of twist as your previous single and spin in a worsted style. off the bobbins and begin treadling. I set the Lazy Kate about 6 feet away from me in order for my twist to better even out in the distance before I ply. 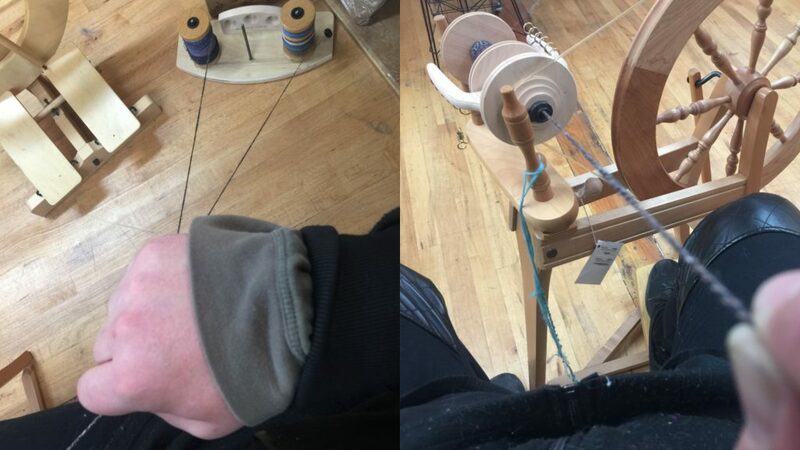 Plying two singles with a Lazy Kate on an Ashford Traditional using a Jumbo Flyer. Since my arm’s length is quite long I treadled approximately 14 times to get the amount of twist desired before allowing the flyer to take the yarn up and disperse onto the bobbin. I used a Jumbo flyer since i knew I had about 4 oz of fiber on each bobbin and would need a bigger bobbin to hold all the yarn. 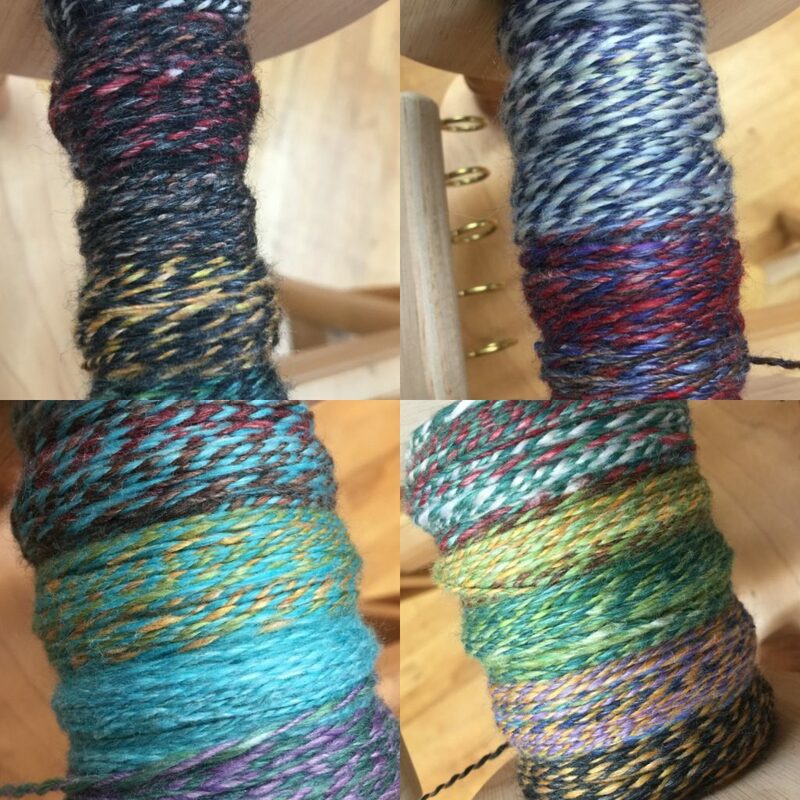 To test the amount of twist, stop treadling and ease the tension on a plied section. If you plan to soak your yarn once finished, a little ply back on itself is okay. If not, you should try to achieve a nice “U” bend in your yarn. 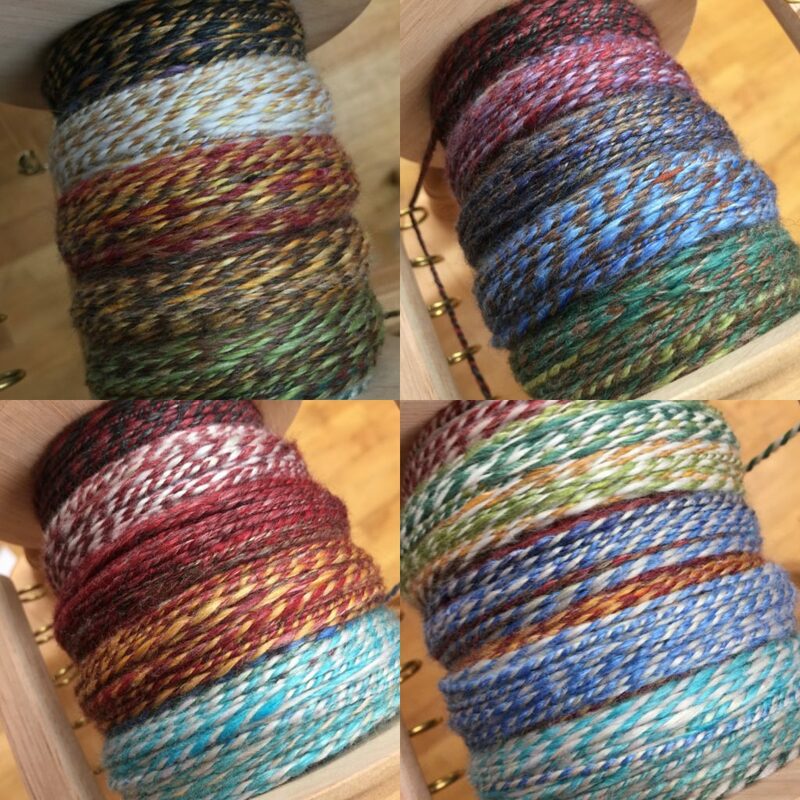 Repeat these steps, giving the same amount of twist for each pull, until your two bobbins are empty. It was very intriguing to see all the different colors align. I stopped several times to capture the interesting fractal effect. 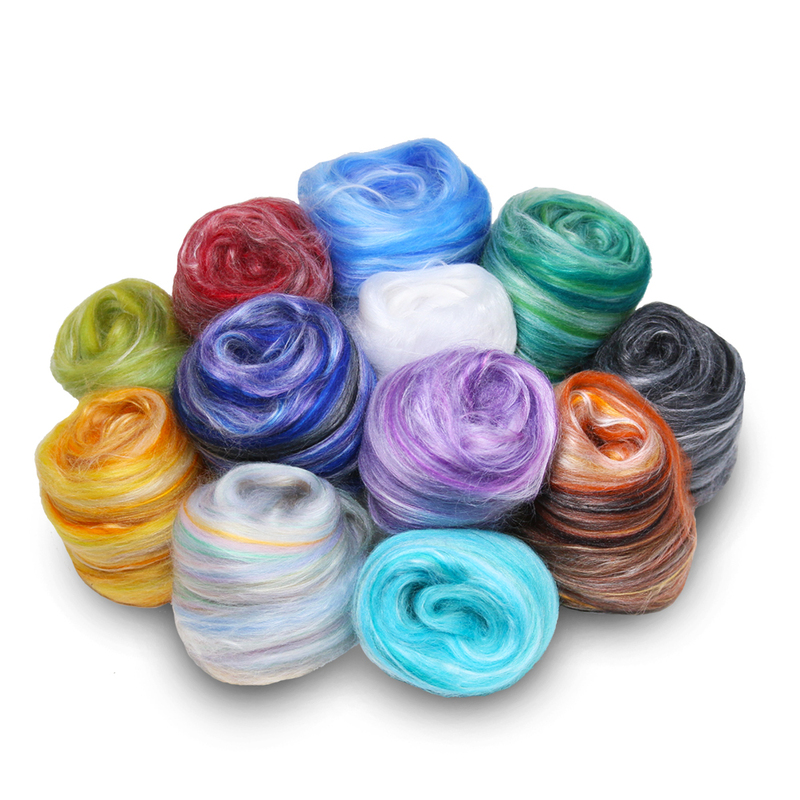 Step 5: Skein and Soak – now that you are a master plyer with a bobbin full of 8 oz. 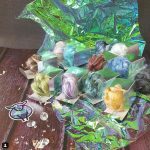 of fractal delight you must skein and soak your beautiful creation! 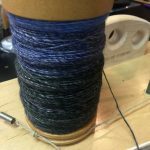 I used a Paradise Fibers Adjustable Niddy Noddy to skein my yarn off the bobbin. I tied the skein in 4 places with scrap yarn to keep it all in place and to prevent tangling. I made sure to count each strand of yarn on one side and multiplied the number by 2 because I set my Niddy Noddy to 2 yards before skeining. I ended up with about 450 yards of yarn. 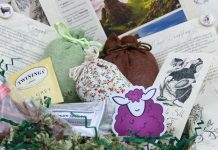 I filled my sink with warm water and a tablespoon of Soak and let my yarn soak overnight. 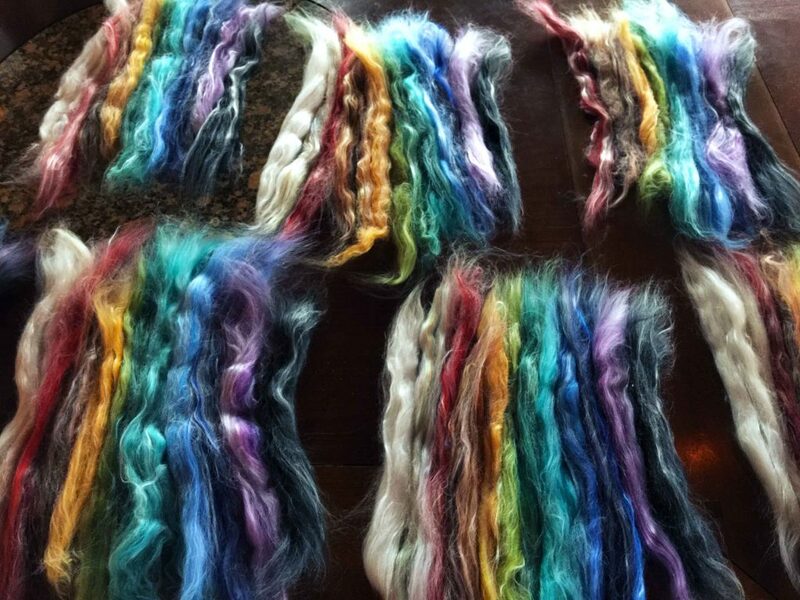 This allows the fibers to really BLOOM and softens the twist. The next morning I gently squeezed out any excess water and rinsed the skein to get all the soak out. Finally I gave my skein a good THWAK! or two on the table and hung to dry. Here are my results! Now what should I make with it…..hmmm. 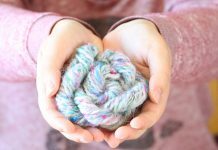 Fractal spinning is a great way to experiment with color and add interest into your yarn! Have you Fractal Spun before? Share your experience in the comments section below. Share this post with your fiber friends if you love it! 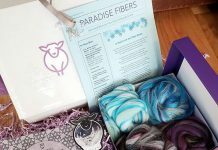 If you’d like to receive exclusive fiber like this every month with a recipe and other goodies, join our club and share your creations with other members in our Ravelry group! Happy Spinning everyone!